Alex Winters has come a long way – geographically and musically. She started out an introverted writer in her home state of Washington who was always jotting down notes and journaling, but was much too shy to ever think about being in a band. She’d been playing the guitar her grandmother had given her since she was 12 and she even played flute in school, but it wasn’t until much later when she got up the courage to play a tune for a friend that Alex started to overcome her stage fright. So it was finally at age 23 that her journey as a musician really began. The friend was in a band in Yakima, and the next thing Alex knew, so was she. The members of Eleven 69 encouraged her to write, challenge herself and play out in front. They saw something in her she couldn’t yet see - the woman who would develop into a staple on the singer/songwriter circuit in Austin, Texas. But first, Alex had to cut her chops in Washington. The band put out one album and an EP, all while Alex continued to gain stage and recording experience. She started connecting with the audience and realized their energy and support was profound. It fueled her drive and kept her moving forward. That progress came in the form of a move to Austin. Alex had visited the city in 1999 and felt at home, connected. She knew it was the place for her to find her own voice as a songwriter and develop her own unique style. The natural born storyteller came out even more and flourished in the new environment. Alex had always been moved by music, and now it was her turn to share her work with even more people. Her songs are very lyric based and she connects with her audience by telling stories of everyday life that they can relate to. Everyone understands love, loss, desire, abandonment and hope. Alex seems to have the ability to put herself in different situations and walk through them, telling the tale of how she would react through her songs. Her mostly acoustic set was filled with guitar melodies and sensitive, expressive lyrics. The sweet, Pop feel of the music was well received, even winning Alex the first ever “Shining Star” Award from Luna Guitars, but it was no longer what she was feeling as an artist. Spending 5 years playing out in Austin between recording projects, Alex continued to work on her craft and participated in a songwriting showcase during the Spring of 2015. A drummer friend introduced her to Luke Garrigus, and that producer would become a game changer for Alex. It was a brief meeting that night, but further research of Luke’s music by Alex cemented her belief that he was “the guy” to help take her sound where she wanted it to go. 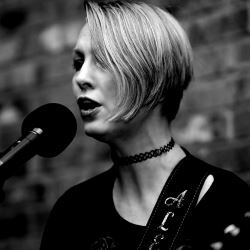 Their collaboration at Blackroom Studios culminated with Alex’s latest EP, “Black Roses.” Alex has transitioned from an acoustic singer/songwriter toward a more blunt sound that shows she isn’t afraid to explore the dark to find the light. The new record has a distinctly Rock feel that might surprise some, while not alienating long-time fans of Alex’s heartfelt songs. Alex Winters is still a poet with a guitar. Her stories of heartbreak, inner turmoil and life’s complications are now told from the perspective of a woman with more of an edge; a dreamer who has walked a few more miles down the road of her own journey so can share her truth.